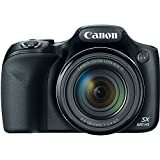 Amazon has the canon powershot SX520 16Digital camera with 42x Optical Image stabilized zoom with 3-Inch lcd (black) for $279 with free shipping. Sells for $299+ Highest Price. Deals for $188 Lowest Price. Normally $243+. High Speed AF greatly helps improve focus speed..